Like the German oma and the Italian nonna, the Spanish abuela is a well-known name for a grandmother. It is sometimes shortened to abuelita, which literally means "little grandmother" and is often used as a term of affection. Abuelita is sometimes shortened to lita or litta. More informal terms that may be used include tata and yaya. In the Spanish language, many words use the -o ending for males and the -a ending for females. Plurals usually take the -o ending. Thus a grandson is nieto, grandchildren are known as nietos, but a granddaughter is nieta. The Spanish language also has words for great-grandmother — bisabuela — and great-great grandmother — tátara abuela. Spanish is an official language in Spain, Colombia, Peru, Venezuela, Ecuador, Guatemala, Cuba, Bolivia, Honduras, Paraguay, Equatorial Guinea and Puerto Rico. Although Spanish is the most widely spoken language in Mexico, it is not recognized as an official language but instead is a national language, a status it shares with dozens of indigenous languages. The United States has the largest number of Spanish-speaking people after Mexico. See also Spanish words for grandfather, a comprehensive list of grandmother names, ethnic names for grandmothers or go to a page where you can hear the pronunciation of abuela. In most Spanish-speaking countries, families tend to be large and members enjoy close, warm relationships with other family members. Family members tend to turn to other family members for assistance rather than to the government or social agencies. Although many women work outside the home, within the home traditional gender roles persist. Women take on most cooking and child care chores, while men take care of vehicles, lawns and outdoor maintenance. Grandmothers are greatly respected, but unless they are in bad health, they are often involved in the hard labor of family life. In Spain, many grandmothers provide child care for their grandchildren. 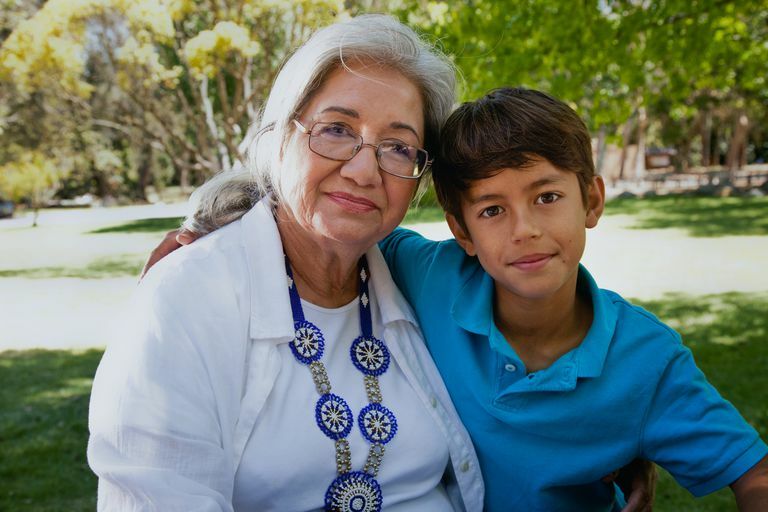 It's estimated that half of grandparents care for grandchildren on a daily basis. There is little government support for child care, and it can be prohibitively expensive. In 2010 union leaders called on grandparents to go on strike. In 2012 one sociologist labeled the phenomenon "slave-grandmother syndrome" and said that it can result in health problems. It's likely that similar situations exist in other Spanish-speaking countries, although grandmothers are unlikely to complain. Most abuelas, like most nonnas, omas and grandmothers everywhere, adore their grandchildren and enjoy being useful. Grandmothers are usually known for their expertise in the kitchen, and abuelas are no exception. Since abuelas are scattered all around the globe, their prized dishes and recipes vary greatly. Here are some traditional dishes that an abuela might cook. Paella may be considered the national dish of Spain. It was originally cooked with rabbit but today most often features seafood and other meats and, of course, rice. Tamales are a traditional Mexican food that consists of various fillings wrapped in a dough made of corn masa. Red beans and rice make a tasty combination in this traditional Colombian dish. A cubano is a traditional Cuban sandwich featuring roast pork. Shrimp and rice are combined in this Puerto Rican stew. Solterito corn and lima salad is a light and nutritious dish from Peru. Bien me sabe is a traditional Venezuelan cake similar to tres leches. Gallo pinto is a Costa Rican bean and rice dish. The PBS Kids website has a game called Cooking With Abuela and also features recipes for grandparents to make with grandchildren.